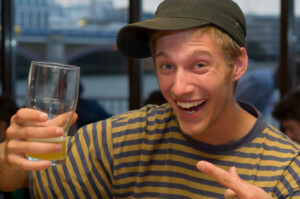 MommaSaid | Should 18-20 Year-olds Be Allowed to "Drink with Dad" in Bars? Browse: Home / 2013 / January / 23 / Should 18-20 Year-olds Be Allowed to “Drink with Dad” in Bars? Why not the Smoking Pot with Mom law then? If drinking alcohol is illegal in all other situations (and this isn’t a sip of communion wine on Sunday) then it should be illegal in restaurants with Dad and Mom, too. There should no rated PG-18 for booze. Either lower the drinking age in all situations or leave it as is. I’d love to set my own laws, too. It would be a great help to me if my 15-year-old could drive, but the driving age is 17 in my home state of New Jersey, the country’s most densely populated state. And you know that somebody’s going to decide their sixth grader can drive to go pick up milk. If we leave laws for issues that affect other people up to parents, where would we draw the line? Mom blogger Jessica Gottlieb respectfully disagreed, saying it’s up to parents to teach kids to drink responsibly, and waiting until 21 is too late. What say you? Is the law a good idea or not? I say it should be 18 all the way around. 18 is considered an adult in every situation but the drinking age. If an 18 yr old cannot be trusted to make good decisions about having a drink, than why should we trust them to vote who can run our country, enter into binding legal contracts among other things. If as a parent you teach your children about using Alcohol responibly, rather than ignore it, we probably wouldn’t have the issues that we have right now. Great. Now that you’ve planted the idea, it’s only a matter of time before the “Smoking Pot with Mom” bill will be on the ballot here. What’s sounds ridiculous elsewhere seems to fly for normal in Colorado these days. I agree with you, and I’m speaking on this same topic to a parent group here in a week or so, so this is timely. I think one thing that appeals to parents who are in favor of such a statute is the sense that it makes you seem ‘cooler’ to your kids. “It’s okay, we’re hanging out together!” One thing that gets missed in that scenario is that kids (even teens) look, sound and act like they’re a lot more mature than they actually are, and even their own parents can be fooled into thinking they “get it” and wouldn’t then binge drink w/ their friends. We have to remember that they ARE still kids, often with very bad judgment. Seems like yet another misguided attempt to be our kids’ friends. Thanks for the extra fodder for my talk!